Call 02380 080681 now. Lines are open 24 hours a day, 7 days a week. Call our personal injury solicitors for Southampton today for a no obligation discussion about cycling accident compensation. Cyclists are amongst those road users who are most at risk of suffering a personal injury. However, many bike riders are not aware that it’s possible for them to claim for personal injury compensation when injured on their bicycle. Despite cyclists typically not having their own insurance policies, if the accident was the fault of a third party such as another driver, a pedestrian or a poorly maintained road, then the cyclist will be able to make a cycling accident claim in Southampton. How Much Cycling Accident Compensation in Southampton? Every bicycle accident claim that we deal with is different. Injuries can range from the minor to the serious. Because of this it’s impossible to give an exact estimate on our website as to how much personal injury compensation you could be due. The only way in which we can advise you on this is when you phone our accident claims advice helpline number. Once you do that our specialists will take as much information as possible from you in order to decide whether or not you can use our cycling accident claims Southampton lawyers. In the past we have seen compensation payments ranging from a couple of hundred pounds to thousands of pounds. Due to the expanding and growing population of Southampton, and a rise in people using their bike or bicycle to get to work and back, we have personally seen a rise in compensation claims from cyclists in Southampton. 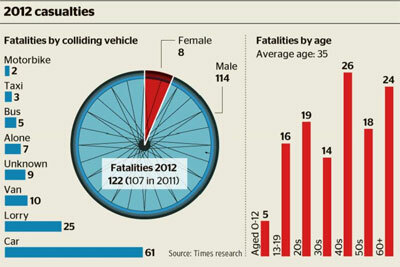 These are statistics for the whole of the UK in 2012. We don’t have numbers for this year yet. We have handled multiple cases in Hampshire and the rest of the UK over the last decade, and our solicitors are perfectly placed to ensure that you stand the best chance of receiving the maximum payouts for your injuries and losses. Please note that the list below is not at all comprehensive, but simply details the most common types of personal injury claims we deal with on behalf of Southampton cyclists. If you don’t see your accident claim type here don’t worry – just call us and explain what happened so we can start your compensation claim with our solicitor and lawyers on a no win no fee* basis. All of the solicitors who deal with cycling compensation are mainly experienced cyclists themselves so know exactly what it’s like to be out on the road and at risk of injury. For more information please call us today to talk about cycling accident claims Southampton.